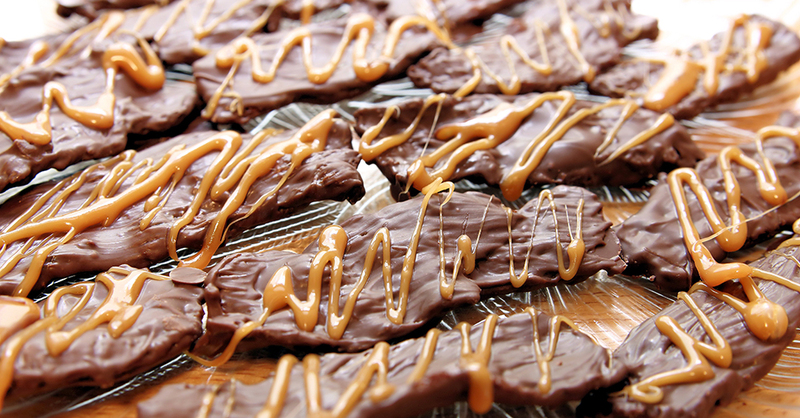 When you get a craving for a decadent snack, try this indulgent recipe for chocolate-covered bacon. The perfect marriage of salty, smoky and sweet, this bacon is dipped in chocolate and then drizzled in caramel sauce. Does it get any better than that?? Ideal for special occasions, this tasty, unique treat makes a great appetizer and is a guaranteed conversation starter when you have friends over. While we don’t make it very often, it’s a huge hit when we do! Fry bacon in a large skillet over medium heat until crispy, then transfer to a paper-towel-lined plate to drain. Blot thoroughly with paper towels to remove excess grease. Melt chocolate and heavy cream together over a double-boiler, stirring until smooth. Dip bacon slices one at a time into chocolate sauce to coat. Place each bacon slice on a baking sheet covered with wax paper and let cool. Once set, drizzle caramel sauce over the bacon slices. Place bacon in refrigerator and let chill for 15-20 minutes, or until set.